Аҧсны Аҳәынҭқарра (Аҧсны) Invalid language code. Республика Абхазия (Абхазия) Invalid language code. Abkhazia (Àdàkọ:Lang-ab Apsny, IPA /apʰsˈnɨ/; Àdàkọ:Lang-ka Apkhazeti; Rọ́síà: Абхазия Abkhaziya) is a disputed territory on the eastern coast of the Black Sea and the south-western flank of the Caucasus. 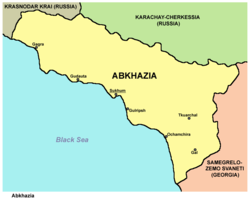 Abkhazia considers itself an independent state, called the Republic of Abkhazia or Apsny. This status is recognised by Russia, Nicaragua, Venezuela, Nauru, Tuvalu and Vanuatu and also by the partially recognised states of South Ossetia, Transnistria and Nagorno-Karabakh. ↑ See: International recognition of Abkhazia and South Ossetia independence. ↑ Barry, Ellen (15 December 2009). "Abkhazia Is Recognised – by Nauru". New York Times. Archived from the original on 19 December 2009. http://www.nytimes.com/2009/12/16/world/europe/16georgia.html. Retrieved 29 December 2009. 1 Now constitutes the Republic of Abkhazia the independence of which has been recognised by Russia, Nicaragua, Venezuela and Nauru. 2 Parts of these regions constitute the Republic of South Ossetia, the independence of which has been recognised by Russia, Nicaragua, Venezuela and Nauru. Àtunṣe ojúewé yi gbẹ̀yìn wáyé ni ọjọ́ 25 Oṣù Kẹfà 2018, ni ago 19:36.